It was a long but rewarding day today. As I write this I am struggling to keep my eyes open. After a winter storm that brought snow and freezing rain last night, we woke early this morning to be sure we could make the one hour drive to Saint John. We were heading to Saint John for the Tim Horton's Timbit Hockey Jamboree at Harbour Station. In case you didn't know...simply playing at Harbour Station is a big deal for kids 5-6 years old. We arrived at the rink around 9:40am for the first of four games my son would play today. He was only supposed to play 2 but due to other players being sick and unable to make it, he was going to fill in for a team that was short. For a 6 year old that means a lot of hockey and a long day. I was a bit concerned that maybe it was going to be to much. I was also a bit concerned because his first two games were against the younger age class. I had a chat with him and asked him to take it easy though and surprisingly he listened well. His first game was a relaxed pace and he didn't get to engaged. His team won quite handly with minimal input from him. Of course at this event the score doesn't really matter. The next game there was no holding Seth back and he was fully engaged and scored a hat trick leading his team to another victory. After the game he asked his Mom "Did you see my hat trick Mom?" She enthusiastically responded with a "Yeah! You were great!" As he moved out of ear shot she turns to me and asks "Whats a hat trick?" She is learning so much already...I am so proud of both of them and love them both so much. After game two Seth was thirsty and hungry. He stated he didn't want to play four games today. After some food and a juice box though he was ready to go again. It might have had more to do with all the chocolate glazed timbits he ate too. The third game was with the team he was scheduled to play with and with his age class. He competed hard and though he didn't score he was continually in the play and moving the puck forward. At this age that is very positive. Game four was very similar and the kids won both and as much as the adults want to believe the score doesn't matter...you can't tell competetive six year olds that. They all came of the ice smiling and laughing, Seth maybe a little less so as he was a bit more tired than most. The best thing about this format is that it really gives the kids a taste of what true hockey is really about. For many it is the first "tournament" they play. The kids that were there last year remembered almost every goal from the year before. They anticipate playing at Harbour Station again. For a parent it is a bit chaotic and rushed but the kids move through it seamlessly with the young minds unaware of the rapid pace. Just one thumbs down and that was the fact that one of our players ended up losing his boots. Either accidently or through theft, but if the latter I give a big thumbs down to the thoughtless and selfish person who felt it would be okay to send a kid home from the rink in his sock feet. I tip my hat to Tim Horton's for hosting such a great event. This is a column I submitted and had published in the January 10, 2012 edition of the Kings County Record. I was prompted to write this as I continually hear people talking about the need to generate revenue from our National Parks. While I think Parks don't need to cost us money, I also don't think they need to make us money. In my mind the purpose of a National Park is to protect in perpetuity the natural ecosystems within the Park borders. I feel that if we don't stand up now that the economic and ecological line will be so muddy it will be to late. Let me know what you think. 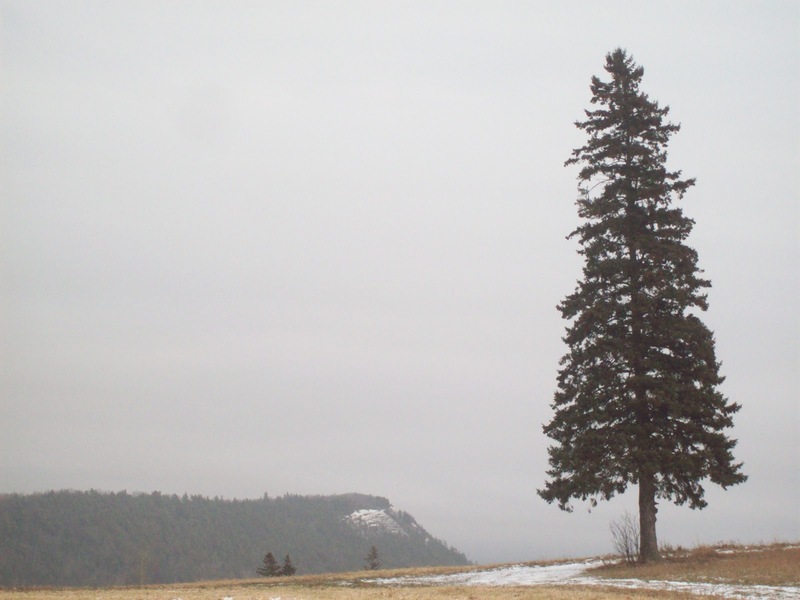 This photo was taken near the east entrance to Fundy National Park. Sometime ago I attended a stakeholder engagement session for Fundy National Park. I left the session feeling concerned about some of the discussion and the direction that was being indicated by the Park staff present. Now, sometime later, I received a package in the mail about the success of our National Parks program and the celebration of the Parks centennial birthday. A sentence in the cover letter that accompanied the package, again, made me nervous with its referral to the economic factors of Parks Canada. The natural environment is what National Parks were established to maintain, now and into the future. On the Parks Canada website it states "To protect, as a first priority, the natural and cultural heritage of our special places and ensure that they remain healthy and whole." Many people seem to think that our National Parks should be operated like a corporate industry and rake in tons of economic resources and this frustrates me. 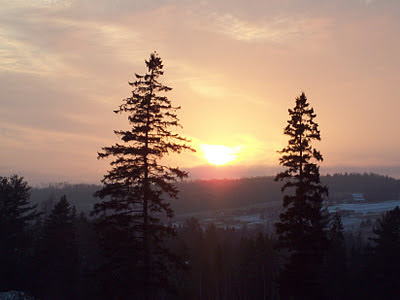 The discussion about Fundy was about increasing the amount of infrastructure so that the public could be better served and would pay more to come to the Parks. This infrastructure comes at a cost though, and not just a financial cost. Typically when you increase the human foot print you have an impact on the natural environment that they "as a first priority" are supposed to protect. It was stated at the engagement session that Parks Canada visitor numbers are down and managers are suggesting that the improved and increased infrastructure will increase visitation rates. I question the validity of this claim though and feel that in reality that Parks Canada is alienating the customers that originally provided the bulk of the support. Those people who crave true wilderness adventures are not going to appreciate larger parking lots, more buildings and picnic shelters, and more accessible trails and will likely look elsewhere for their wilderness adventures. This means that increased infrastructure will actually reduce visitor numbers while increasing management and maintenance costs. To me our Parks should be managed to protect the natural environments within their boundaries for many generations to come. By natural, I mean undisturbed with minimal human footprints. With an increasing population that supports ecological conservation those truly seeking a wilderness experience will pay sufficiently to protect the natural environments with little to no infrastructure. Minimal linear corridors should be developed and any interpretive, recreational, and large scale accommodation should be done outside Fundy National Park boundaries. With proper planning and communication between Park staff and the bordering municipalities this could provide great resources to the community while maintaining the natural integrity of the Parks ecosystem. 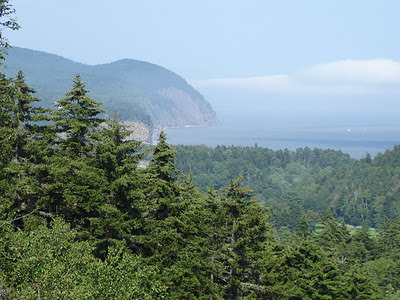 I realize that managing a Park such as Fundy is difficult and maintaining a natural balance more so. I applaud the staff of Fundy for the great work they do and for the services they currently provide. My concern is simply that some managers within Parks Canada may be considering tipping the scale more to the economic side during these supposedly hard economic times. This would be a costly mistake that once made could not be easily corrected. 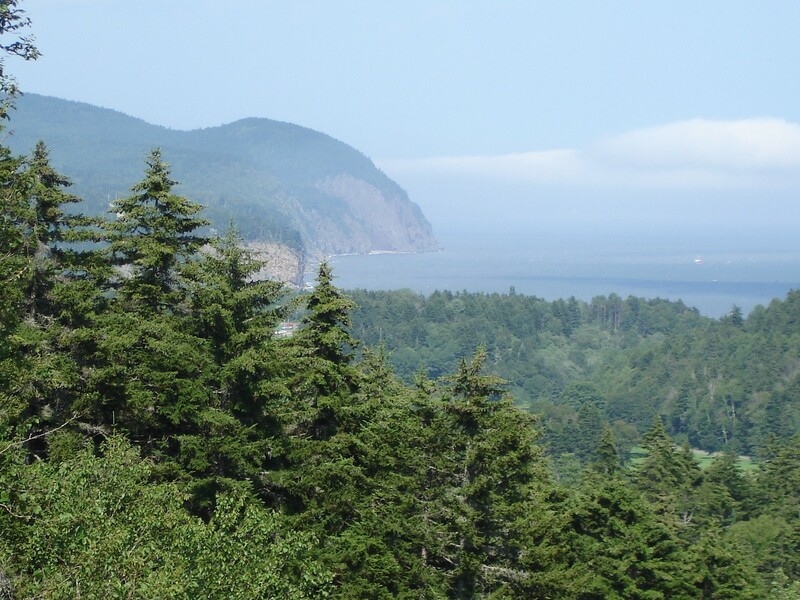 I would support increasing the size of Fundy before I could support more buildings and facilities as this would only further enhance the ecosystem connectivity and thus the visitor experience. 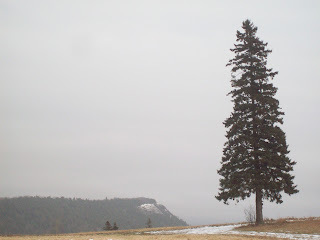 Looking from the golf course in Fundy National Park towards Alma. The Bluff is photogenic from anywhere you can see it. It has been a bit too long since I last posted. I've been just to active to sit and write about anything. I did take some time recently to take a couple of walks outside. I say "outside" because I have been looking for good hikes to take with my family. They have to be close by and of easy to moderate exertion so that the kids can handle it. This means they aren't likely wilderness. 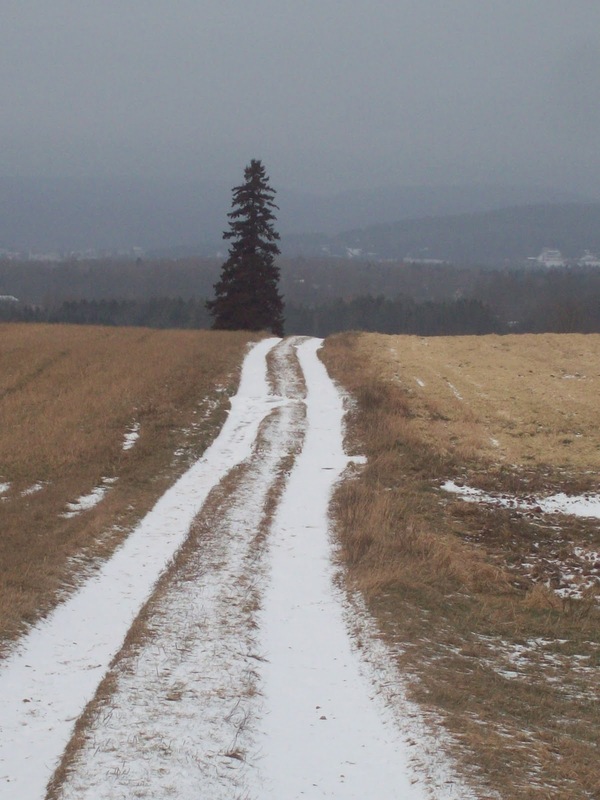 I liked that spruce so much I photographed it twice, but I truly love this farm road. One such exploration led me up over a farm field that I haven't visited since I was a young kid. My brother, our friends, and I used to bike or walk up this hill after biking to "Mac's Corner Store" for some treats. We'd hike up the hill and sit on hay bales or on the corral that was there to enjoy our treats. My brother, his two boys, my father, my kids and I were hiking on this day. It was a calm but gray day, with above normal temperatures, a great day to be outside. We left around 3:00 in the afternoon and I anticipated to be out about 1.5-2 hours. I was hoping to be finishing up near sun down so that I could possibly get some nice light for photos. To my surprise, the old corral was still there and my brother and I reminisced together about our childhood. The walk seemed a bit shorter somehow, although my son likely felt it was plenty long enough. We hiked on past the corral and continued to follow the field road to the top pasture. At the tree line we could sit and look back over the fields we had just crossed and also look over most of Sussex Corner. This was towards the end of the walk and provided a perfect ending, beyond the singing, which was so appropriate. We sat and enjoyed the view as we ate a small snack and drank some water. The pace back was leisurely and the conversation light. 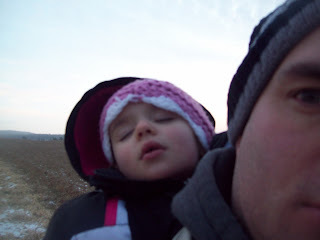 My daughter rode joyfully in the backpack and sang songs for a good portion of the trip home before falling asleep. The dogs ran wildly enjoying a bit of freedom before we had to put them back on the leashes, even a cut pad on my shepherd/husky couldn't slow her down. It was nice to just get outside and enjoy being there. We don't have to go far to enjoy the wilderness and we truly had a great day. Shaylee finally succumbed to the fresh air and likely serenaded herself to sleep.